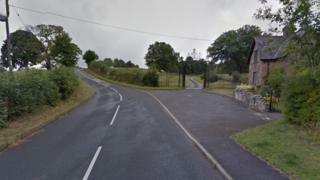 A moped rider has died following a road crash in Flintshire. The emergency services received reports of a collision involving a Fiat 500 car and a moped in the Tower Lodge area of Nercwys Road, Mold, at 11:55 GMT on Wednesday. North Wales Police said the male rider of the moped was pronounced dead at the scene. The air ambulance was also in attendance and the road was closed for several hours.